There is no official A-list report that comes out annually, but usually, someone who is on the A-list, their name is recognized, their face is recognized, and gossip is created out of thin air about them to sale papers and get web hits. Although Michael is not a household name yet like Brad or Leonardo, when the Hollywood Reporter put Michael on their cover two weeks ago, they just referred to him as 'FASSBENDER'. He has arrived! 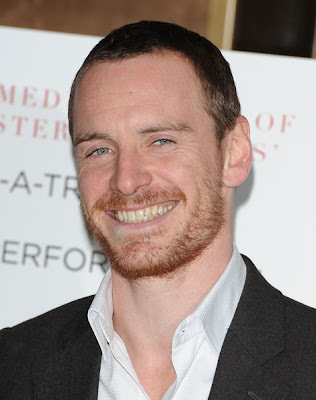 Prometheus will come out in June, he will start filming '12 Years a Slave' this summer, and he has signed on for another X-Men film as the younger Magneto. This is just what we know now, it can change next week. Because Michael is in high-demand, I was thinking the other day that if we fans had a choice of what kind of role we would like to see Michael in for a future role, I know I would like to see him in a crazy British dark comedy, in the roots of 'In Bruges'. What kind of film/role would you like see Michael in? There are a lot of roles i would like to see him do, but most of all, if they will ever decide to make a remake of anya seton's "Dragonwyck" he should be Nicholas Van Ryn, a role Vincent Price did marvelously in the 1946 film adaptetion. Also he must work with the Coen Brothers! I wouldn't call him A-list yet. Probably a solid B as of right now. He will get there. I would LOVE to see him in a musical - he can sing, and play the piano and accordian, and I bet even Hugh Jackman can't play the accordian! And yes, also a comedy, because we all know he has a fantastic sense of humour but doesn't often get to express it onscreen. It would be nice to see him in some more British/ Irish films before we lose him to Hollywood completely. I definitely want to see in a dark comedy. The screenplay has to be great though. A musical is also a must! I think they probably are the only two genres that Michael hasn't touched on, which he is also showing a great interested in. With his natural funny/goofy nature, great sense of humor and singing and dancing talents, I think he definitely can rock‘n roll on both genres. Also,somehow, I want him to play Vincent Van Gogh. Actually, thinking about it some more, I would really like to see Michael star in some Irish films. Because he's spent his entire career based in London, he hasn't been able to use his own accent very often - only in Fish Tank, as far as I'm aware. I really hope At Swim Two Birds gets made, but if not, someone needs to cast him in something with Brendan Gleeson. That would be a movie I'd pay a lot of money to see! I saw "Drive" last night and thought how BRILLIANT Michael would be in a role similar to Gosling's. Dark, brooding, yet somehow innocent and sympathetic. I would love to see him in a Lord of the Rings kind of movie, playing an Aragorn kind of character. The high quality of the LOTR trilogy would naturally be a part of the production. Yeah, I don't think Michael's A-List quite yet. He's a hot commodity in the industry right now, but the general public has yet to catch up. When he becomes a household name, then he'll officially be A-List. To be honest, I don't know if I ever want him to attain that level of fame. I'd prefer respect and notoriety ala Daniel Day Lewis. can I say, ANYTHING!!! !I just can't stop liking him. I know whatever he will choose to do in his life it will be brillant. I saw someone mentioned Gosling's role in Drive. I can think of another Gosling role he would have been brilliant in: Lars and the Real Girl. Lars is such a sweet, sympathetic, quirky character. Just totally endearing and yet slightly "off". Michael would knock something like that out of the park. Honestly, I dont like to see him on the A list, because people from the A list are often in those stupid gossip magazines and some, you know, change. I just dont wanna see Michael getting lost =D he's such a wonderful and humble men. Although I dont know him of course, I saw many interviews and thats something you can notice.